The Egyptian Museum in Mississauga holds in trust for Canada and the World a chronological statement for the ancient history of Egypt over the past 7000 years. The new museum is to pay homage to eternal Ancient Egyptian and Coptic Artifacts. The Egyptian Museum will allow Mississauga to become a major worldwide hub for Pharaonic and Coptic history and a must-visit place for Canadians, and visitors from across the border. The museum and the cultural Centre aims at taking grasp of the diversity of Egypt's heritage of monuments and arts needed to be shown in one place in one location to maintain and preserve this huge legacy. The Museum and The Cultural Centre contributes largely to the Multicultural wealth of Canada and get Canadians involved in one of the greatest Civilizations in the history of mankind. Gold King Tut Mask - Description of the Death Mask of Tutankhamun The King Tut Mask, which is pictured above, depicts an actual likeness of the young Tutankhamun. 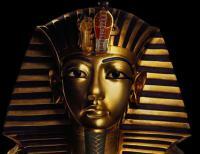 The King Tut Mask weighs ten kilos, 24lbs and measures 54 cm (21 in) in height and 15 inches wide. The workmanship is quite exquisite and its value is priceless. The Canopic Shrine of Tutankhamun consisted of four miniature mummy-shaped gold sarcophagi in which the embalmed internal organs were preserved. They were inserted in the four compartments of the alabaster canopic chest and were covered with beautiful stoppers in the shape of the king's head. The golden throne that Howard Carter discovered in the Antechamber beneath the hippopotamus couch is similar to the chair belonging to Sitamun. 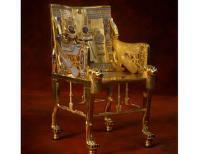 The style was popular for royal chairs of the Eighteenth Dynasty. Instead of female torsos protruding from the seat, however, the more traditional lions are in their place. King Tut Sarcophagus - Definition The Ancient Egyptian Sarcophagus is synonymous with the famous artefacts found in the tomb of King Tut. 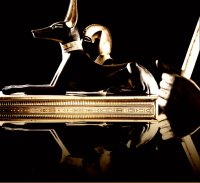 What exactly was the King Tut sarcophagus and what was its purpose? 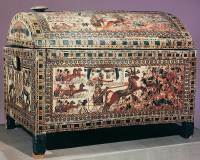 Definition (plural: sarcophagi) : A sarcophagus is a stone container that usually houses a coffin and an Egyptian mummy. The 50 seats movie theatre presents documentary and historical movies that supplement the story of the oldest civilization of mankind and greatest discoveries in the history of the world. Shows every Wednesday night at 6:00 p.m. Social movie nights hosting historians and speakers. Explore highlights of the collection through a variety of tours with trained Egyptologists and tour guides. Engaging tours in: English, French, Arabic and other languages, upon request, are available. Guided tours are arranged by previous booking. Pharaohs Talk: Students engage directly with works of art in the museum through talks led by curators, conservators, educators, and invited specialists. Talks focus on specific aspects of the collection or on special exhibitions. At the end of the third century AD, the religion of Egypt had become predominantly Christian, and it would remain so until the advent of Islam in the seventh century. This period of Egyptian history as part of the Eastern Roman Empire is known as the Coptic or Byzantine period. The Coptic church is one of the eastern orthodox churches, which, together with the Syrian orthodox church, separated from the church of Constantinople in 451 AD. Coptic Egypt used the indigenous Coptic language for religious matters, while Greek served as the language of the administration. The monastic movement originated in Coptic Egypt (Saints Anthony and Pachomius), and monasteries were built across the country, such as the monastery of Anba Jeremias in Saqqara that was founded around 470 AD and functioned until the middle of the ninth century. In the arts, Coptic Egypt is famous for its elaborately decorated textiles that are preserved in many collections. 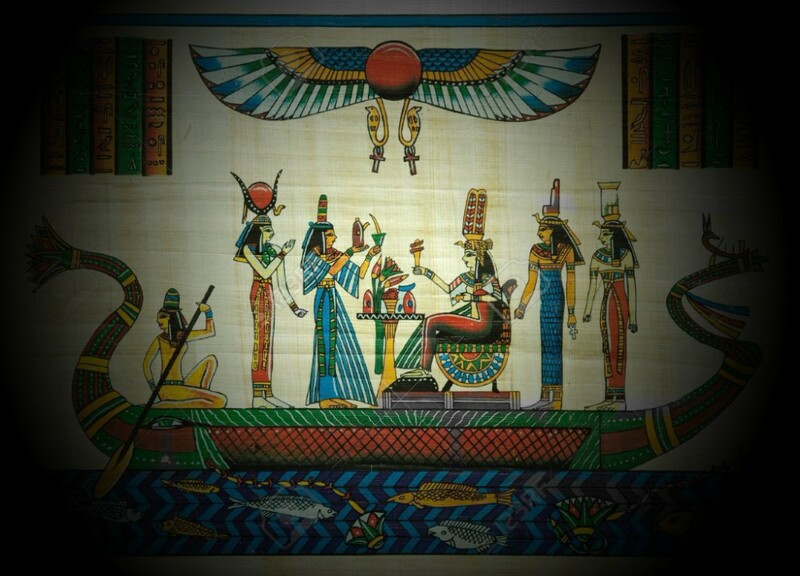 Visit Ancient Egypt Today at..
" please call for prices "